1983 The Florida National Guard Foundation was founded as a Non-Profit Organization with the purpose to provide charitable and educational aide in the form of money and other property and services. 2003 On June 13th Governor Jeb Bush approves the Florida National Guard Foundation to become a Direct Support Organization to the Department of Military Affairs under State Statute 250.115. Since 2001, the Foundation has teamed with organizations like Yellow Ribbon, American Red Cross, Survivor Outreach Services, Operation Homefront, local Elks organizations and VFW’s to provide assistance to our Soldiers and Airmen. With the ongoing demands placed on the Florida National Guard, many of the members of the Florida National Guard have been on multiple deployments. These deployments, along with the many natural disasters that the Guard has been called out for, have placed a burden on our Soldiers and Airmen. To support our mission, the Florida National Guard Foundation must actively engage in fund raising. Additionally, we support our Wounded Warriors and honor those who have made the ultimate sacrifice. We are also proud of our commitment to preserve the rich history of the Florida Army and Air National Guard. Since 2001, the Foundation has provided over $1.5 million in assistance to over 1800 members in support of our mission. We pay bills direct for essential items and provide gift cards for food and gas. We have provided $75,000 in scholarships and help fund the Back 2 School Bash which provides needed school supplies for our service members’ children. We are currently seeking funding for Camps for Deployed Service Members’ Children to help them understand and cope with their parents or siblings being gone for long periods of time. The Foundation is always looking for new ways to help our members deal with the stress of being away from their families and defending our great state and nation. And we are here to help the families of our members, because when you are a member of the Florida National Guard, you are Family. Empower our Service Members to deal with their financial crisis therefore allowing them to concentrate on their mission to keep our state and nation safe. Respect the dedication and sacrifices that our Wounded Warriors have made in defense of our state and nation. Honor those sacrifices with assistance and encouragement. Work with other agencies to ensure we provide the best service possible to the members of the Florida National Guard and their families in their time of need. Help our service members to find their work-life balance by assisting them in their time of need. Help our members balance the needs of the families with the need of the military and other aspects of life. 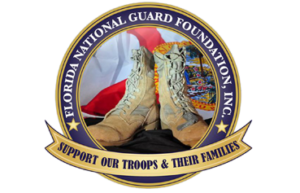 For the latest in news, events, and meeting dates/times please go to our Florida National Guard Foundation Facebook page.